As usual, i'm just sharing my lovin' for my new mint coat, but it's really cute so you can't blame me! I just wanna apologise for my shittiness the past week with my posts, i've been so busy, but it's almost the weekend so I thought i'd get up early and squeeze in a cheeky post before I went to my lecture. My current project ends soon so i've been super busy designing like a crazy lady aswell as helping to sort the Cage City press day which is next week (hit me up if you're going, it's gonna be coooool!) so, an exciting week as always in Laura-land! I love this coat it looks beaut, especially with the berry skirt :) Everyone is focusing on pink this season but I love this colour, I saw a similar coat in Miss Selfridge and fell in love with it! Thank you! Gorgeous colour isn't it, and dead cheap! Haha you should get it! It's real cheap and you can use my discount code! Stunning outfit, love the coat!! Gorgeous! 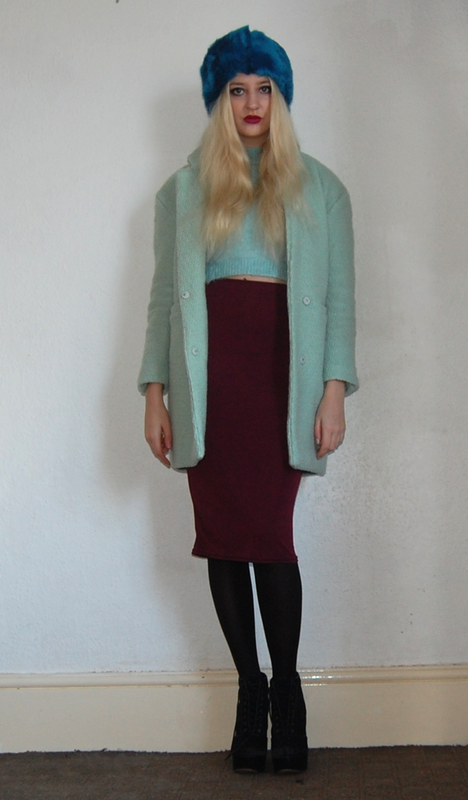 The mint/burgundy color combo is so inventive and works great! So jealous of that coat. Ah thank you! I'm glad you like my weird colour combo haha! Such a gorgeous outfit! I love the coat! !